Liners to America, the Beatles, the Dockers' Strike, City of Culture - Liverpool is proud of its tradition as an independent, innovative, friendly city. A great mix of historical architecture and contemporary design, Liverpool has plenty to offer the visitor today. The history of this port city lead UNESCO to declare major parts of the city a world heritage site in 2004, dubbing it the Liverpool Maritime Mercantile City. In 2008, Liverpool was the European Capital of Culture, and invested heavily in art and sculpture projects which still dot the landscape today, and has a number of theatres and museums for those interested in culture outside of The Beatles. Central Liverpool - There are a number of bars and restaurants centred around Matthew Street, including the famous Cavern Club. Running from the train station down to the waterfront, there is a most pedestrianised shopping area including the Met Quarter and the £1 billion dollar renovated space at Liverpool ONE. Wallasey and New Brighton - across the Mersey river in Wirral, Wallasey and New Brighton run in a 3-kilometre-stretch from the Seacombe Ferry terminal to the mouth of the Mersey river. You can walk from the ferry terminal to New Brighton along the 3-kilometre-long Millennium Trail. Key sites along the way are the Wallasey Town Hall, the New Brighton arcade and the Fort Perch Rock. At the Seacombe Ferry Terminal is also Spaceport, an exhibit of space and space travel, mainly aimed at children. Birkenhead - The second stop of the ferry on the other side of the Mersey in Wirral, Birkenhead has a few sites of interest. The Birkenhead Priory was home to the monks that ran the Mersey Ferries during the middle ages. Birkenhead had the first street tramway in Europe, and today two wooden trams, imported from Hong Kong, have been brought into service as part of a heritage tramway. Hamilton Square is the main square of Birkenhead, built in the late Georgian and early Victorian area. Three of the sides of the square are Georgian terrace houses, with the four side having the town hall (which is now a museum). It is second only to Trafalgar Square in London for having the most Grade I listed buildings in a single square. Finally, the ferry terminal has a U-Boat exhibit, including a U-Boat you can see. Southport - Just a 40-minute train journey from Liverpool central station lies the victorian seaside town of Southport. With its victorian architecture and the U.K's oldest iron pier, Southport is a prime example of an era which is sadly being lost to modern development. Old school b&b guesthouses can still be found along the front and Lord street has a fantastic array of shops, restaurants and bars. The parks and gardens are still as attractive as ever and the region has miles and miles of stunning unspoilt coastline. The beaches are vast and beautiful. There are world class golf courses in the area as well as stunning pine woods and the U.K's largest region of unspoilt sand dunes. Mersey Ferry - Ferries have been crossing the Mersey river for probably over 1,000 years. There was a record of a ferry crossing the Mersey from Seacombe in the Domesday Book in 1086. Leaving from the Pierhead in the shadows of the "Three Graces" (the Royal Liver Building, the Cunard Building and the Port of Liverpool Building) along the Mersey River, during the week at rush hour, the ferry service is a commuter service, running between the Seacombe ferry terminal in Wallasey, the Birkenhead ferry terminal and the Pierhead in Liverpool. Off hours and during the weekend, though, the ferries run River Explorer Cruises. These cruises run for about an hour, with two stops. Details and tickets available from Mersey Ferries. Ticket prices are £6.30, and can be combined with tickets to the Spaceport attraction and U-Boat experience across the river. The Albert Dock and Maritime Museum - Opened in 1846, the Albert Dock was the first enclosed dock made out non-flammable materials. Today, the Albert Dock is one of many docks along the waterfront of Liverpool no longer in use, as most of the shipping has moved away from the city centre to the larger container ports downstream and upstream. Instead, the dock holds museums, bars and restaurants, including a branch of the Tate Museum and the Maritime and Slavery Museum, detailing the sea-faring history of the area, including the cities place in the Slave trade with America. The Albert Dock is also home to The Beatles Story, which tells the history of Liverpool's most famous sons. 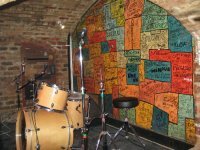 The Cavern Club - Inspired by basement jazz clubs in Paris, the owner opened up a music club in a basement that had been used as an air-raid shelter during the Second World War. Famous for bringing in local acts, The Beatles made 292 appearances here, including one on the 9th of November, 1961, when Brian Epstein saw the group and signed on to be their manager. Today the club is still open, showcasing local talent along side Beatles tribute acts. Admission varies depending on the act, but it is generally free during the day to enter. Liverpool Philharmonic Orchestra - One of the best orchestras in Britain, and probably Europe. Two very different cathedrals sit at opposite ends of Hope Street, the Anglican Liverpool Cathedral and the Catholic Metropolitan Cathedral. The Liverpool, started in 1904 and completed in 1978, is a traditional Gothic design with imposing large spaces and magnificent stained glass windows. The Metropolitan is very modern, and despite looking newer, the Met was consecrated in 1967, meaning it was completed before the Gothic Anglican Cathedral down the street. The Met is circular in design and topped with a round spire with spikes jutting up into the air. The Bluecoat - The the Bluecoat is the oldest Grade 1 listed building in Liverpool’s city centre (dating back to 1717). Following a £14.5 million redevelopment, it re-opened in March 2008, as a major landmark on the UK map of contemporary culture. With a new wing of galleries and a state-of-the-art Performance Space, the Bluecoat showcases talent across all creative disciplines including visual art, music, literature, dance and live art, and nurtures new talent by providing studio spaces for artists within a unique creative community. Several historical parks - http://www.croxteth.co.uk/Croxteth Country Park, Sefton Park and Calderstones Park are by far some of the more famous. Each offers stunning Edwardian and Victorian architecture from the cities vibrant past. The Grand National is run at Aintree Race Course annually in early April, and is one of the biggest horse racing events in the United Kingdom. The race dates back to the early to mid 1800s, though there is debate about when the first race was actually run. The Grand National is a four mile "National Hunt" horse race, sometimes known as Steeple Chase, where horses have to jump over obstacles like fences, ditches and water. The nearest train station is Aintree Station, directly opposite the racecourse, where regular trains run every 7.5 minutes on racedays from Liverpool Central Station. Since 1982 the city has hosted the now world famous Matthew Street Festival. The festival boasts over 80 hours of free outdoor live music over the August bank holiday weekend. Six outdoor stages across the city centre become hosts to a large number of bands. See bands, old and new, Beatles tribute groups and more from all over the world. Crowds gather from far and wide to attend this ever popular celebration of music. Hotels and hostels get very busy over this weekend so be sure to book before you arrive. In September 2011, the Mersey River Festival is returning to Liverpool and will feature a royal naval visit, historic Tall Ships and Cruise Liners including the Queen Elizabeth and the Queen Mary 2. The Waterfront will come alive with aerobatic displays, street performers and a farmers market. All taking place along the ever developing waterfront region. It is sure to be an exciting and busy weekend. As Liverpool is located near the sea, the temperatures don't show extremes. In the winter it can be cold, but temperatures usualy stay above 0 °C during the daytime, and accasionally below 0 °C in the night. The weather starts to turn nice in April and the summer is enjoyable, with highs around 20 °C. In September it starts to rain more, with the rains lasting through the winter. Liverpool John Lennon Airport (LPL) offers a wide range of flights including some intercontinental. The airport is 8 miles (13 kilometres) from the city centre. Alongside domestic services, there are also regular scheduled flights to dozens of locations across Europe, North Africa as well as North America. Car: the airport is accessible by the M53 and M56 motorways via the A533 to the south, and the M57 and M62 motorways via the Knowsley Expressway to the north of the airport. Rail: The nearest railway station is Liverpool South Parkway railway station, from which there are regular bus shuttle services to the airport. The station provides frequent rail services to central Liverpool, Crosby, Hunts Cross and Southport, on the suburban Merseyrail network, together with longer distance direct links to Manchester, Birmingham, Sheffield, Nottingham, Grantham, Peterborough and Norwich on the National Rail network. Bus: There are also regular bus services linking the airport with the surrounding urban areas. Express shuttle services also operate to Liverpool and Manchester. Less well connected than other major cities, however direct connections are available to London, Manchester, and to destinations in North Wales. The main train station is Liverpool Lime Street station. The trip to London Euston is 2.5 hours on Virgin Trains or London Midland. First TransPennine Express provide direct train services to Liverpool Lime Street from Manchester, Leeds, York and Middlesbrough. From the M6 the city is easily reached via the M58, M56 and M62 motorways. Liverpool city centre is approximately 45 minutes' drive from Chester, Manchester and North Wales. There are half hourly services from Manchester, services every hour to York and every two hours to London and Birmingham on National Express. The National Express coach station is located in Norton Street, Liverpool City Centre. The Isle of Man Steam Packet Company run a regular service between Liverpool and Douglas on the Isle of Man. The ferry leaves from the Pier Head at the foot of Chapel Street. Norfolk Line runs services between Dublin, Belfast and Liverpool. The boats leave from Birkenhead, across the Mersey from Liverpool. P&O Irish Sea run ferries from Liverpool to Dublin. Liverpool has a 350-metre-long Cruise Ship dock close to the Pier Head for cruise ships entering town. Mersey Travel operates public transit in Liverpool and the surrounding area, running the local tube (MerseyRail) and buses. Buses run out from the centre regularly from Liverpool ONE Bus Station (mainly to the south) and Queen Square (mainly north/east). Both bus stations have travel centres with staff who will assist with which bus to get and from where. These travel centres also stock free transport guides and detailed timetable leaflets for each bus and train service. Highly recommended are the free 'map and guide' leaflets of the four main transport areas: Liverpool, Wirral, Southport and St. Helens; these giant fold-out street maps show at a glance the route of every bus service (individual service leaflets are required for timetable information). In terms of pre-paid travel passes, Saveaway, Solo and Trio travel passes can be purchased from travel centres or Merseyrail stations. Liverpool and its surrounding areas are divided up into areas, each sub-divided into zones: the cost of each ticket typically depends upon how many zones/areas the purchaser wants to travel in. If a journey takes the ticket holder outside the boundary allowed by their ticket, they can typically purchase a regular ticket on the bus or train to cover just the extra required. The main 'metro style' train stations in the city centre are Central, Lime Street, Moorfields and James Street. Lime Street is the terminus for many national lines and the local city line to Manchester. Moorfields is just off Dale Street, ideal for the business centre of Liverpool and Central is usually used by shoppers and visitors. Local trains run very frequently between Hunts Cross, Kirkby, Ormskirk and Southport on the Northern line. They run every 15 minutes from Monday to Saturday and 30 minutes on Sunday. Central station is the main station for the Northern line, although the 'loop' links the three main city centre stations. The Wirral line forms the link between the Lime Street, Moorfields and Central, so all of these stations act as an interchange between the City, Northern and Wirral lines. A new station in the south of Liverpool replaced the old Garston and Allerton stations in June 2006. This links the Northern and City lines and is ideal for the airport. It also acts as an interchange for a number of local buses. The city is generally flat, so walking is a decent option. Some of The Beatles sites (like Penny Lane) are pretty far out, so public transit may make more sense. Liverpool’s citybike cycle hire scheme offers bike hire from more than 140 stations across the city. It's the largest public bicycle hire scheme in the country outside London and there will soon will be a total of 1,000 bikes available to hire spread across 160 locations. You need to register if you want to participate (available by internet or phone call). If you want to hire a bike for a longer time at a stretch, Citybike may not be too convenient. There are various pubs serving food across the city centre and its suburbs. The two main areas are the City Centre and Lark Lane about three miles from the city centre in Aigburth. There are various restaurants on Allerton Road (near Liverpool South Parkway) as well. Expect to spend around £10-£15 for a meal for two. Check with your hotel first if they allow food delivery. There is also quite a number of places to eat in Liverpool One. Upstairs Restaurant Bar - Located on the first floor, Upstairs at the Bluecoat offers locally produced, seasonal food together with a great wine list, a children’s menu, a special Sunday lunch menu and the most creative backdrop in town. Sunday and Monday (11:30am - 6:00pm); Tuesday until Saturday (Lunch: 11:30pm - 3:00pm; Afternoon tea: 3:00pm - 5:30pm; Dinner: 6:00pm - 11:00pm). Address: School Lane. 0151 702 7783. Espresso - Grab illy coffees, Jing leaf teas, soft drinks, sandwiches, soups and salads to enjoy in the Bluecoat’s building hub, its iconic courtyard or its peaceful garden. Free wi-fi and daily newspapers available in the hub. 8:00am - 6:00pm daily (later when there is an event on). Address: School Lane. Circo is located on the Albert Docks and is a unique circus themed bar and restaurant. Inside style compliments the theme as do the circus acts that perform live on the busier nights of the week. Many celebrities have been know to pop up here from time to time as it is a perfect location for a party. The restaurant itself offers a range of European and classic dishes. There are good offers throughout the week and a Sunday dinner menu is available. Beware of the strict dress code. The Pilgrim on Pilgrim street is a popular hang out for the Liverpool student community and is a good example of an establishment in the city which offers value for money. They do a range of classic British pub meals including a full English breakfast and sunday dinners. The venue has live entertainment including live jazz bands and open mic nights. Mon-Sun (10:00am-11:00pm). There's a good selection of pubs, clubs and bars to suit a variety of music and atmospheric tastes. Friday and especially Saturday nights are the busiest nights, although a few bars are busy with students throughout the week. The areas around Mathew Street and Concert Square with nearby Wood Street are the main two nocturnal focal points. There is a good mix of locals and students. It is best to dress smart for the majority of bars and clubs (such as "Society" and "Garlands"). Notable exceptions are places like Le Bateau, the Krazy house, the Caledonia and other places of a similar alternative style. Like any major UK city, it is pretty safe out at night. The local police have had a heavy presence on a Friday and Saturday night to combat any problems and are largely succeeding. It is pretty busy getting out of the city centre at the end of a weekend (especially at the start of university term time - Sep/Oct). There are plenty of black hackney cabs which congregate at various taxi ranks. The Merseyrail system works until about midnight, whilst there are a series of dedicated night buses which run from the main bus stations, usually for a flat fare. All modes of transport tend to become very busy from around midnight. Liverpool is home to the Cains brewery which produces a large selection of cask beers. Blue Bar and Grill is located on the Albert Docks and is one of Liverpool’s most stylish venues. The cafe and bar overlook the world famous waterfront. The stylish interior does not detract from the rustic charm. The original brick walls from the old dock warehouse and brick arch walkways are still very present. Baby Cream is one of the cities most popular spots for nightlife. Found at the Albert Dock the modern bar and lounge is run by the same company that owns and created the night club also located in Liverpool Cream, so fans Cream and its music will feel right at home here. The crowd it attracts is sophisticated and glamorous. It is upmarket yet friendly. There are a number of hotels in the city, ranging from budget guesthouses and lodges to 4 star international properties. Liverpool presently has no 5 star hotels although the Hope Street Hotel, a boutique hotel on Hope Street and easily Liverpool’s finest hotel, would certainly qualify if it wasn’t far too posh to bother with things like stars. Y.H.A. Liverpool is a modern purpose built hostel within walking distance of the city centre. Hatters Hostel. Liverpool is just a stone's throw away from all central Liverpool attractions. Shopping at the Bluecoat - Bored of the high street and looking for something unique? Visit the creative, independent retailers at the Bluecoat and find something beautifully designed, hand-made and made to keep. Located at School Lane. Liverpool One is the cities newest retail complex, featuring over 140 shops, bars and restaurants. It also has an Imax cinema, crazy golf and it's just across the road from the historic waterfront. For vintage clothing and unique designs check out Grand Central Liverpool, a shopping arcade on renshaw street. Commonly know as Quiggins due to the business affiliation with the old Quiggins shopping arcade which has now gone, this new shopping complex offers an ever expanding number of small businesses offering everything alternatitve, gothic and vintage. Along Whitechapel in the heart of the city centre you will find the Metquarter. This upscale shopping centre offers a shopping experience unlikle any other in the city. Hosting some world famous brands such as Armani and Hugo Boss. It is a mere stones throw away from the world famous cavern quarter. Bosting over 150 stalls, food court and live entertainment there are not many who can count the Liverpool Heritage Market as just another shopping establishment. Within the walls of the Stanley Dock Tobacco Warehouse the market takes place every sunday between 9:00am and 4:00pm all year round. The building itself dates back to 1901 and is the worlds largest brick warehouse. It is truly an historic attraction in the oftern overlooked northen outskirts of the city centre. Stanley Dock, Great Howard Street. Internet cafés can be found in many cities and towns. All UK public libraries provide access, often branded as "People's Network", usually at no or little charge, though there is usually a time limit. Some hotels/hostels also offer internet access, including wifi, but most times at a cost. Using the internet on your personal phone can become expensive very quickly, with carriers charging 100's of times the local rate for data. To avoid these expensive roaming charges, you can hunt for wifi at a local cafe or hotel, or rent a mobile hotspot via several providers including DATAPiXY, and XCOM Global. In case of emergency, call 999 or 112 from any phone. Such calls are free and will be answered by an emergency services operator who will ask you for your location, and the service(s) you need (police, fire, ambulance, coastguard or mountain rescue). You can call this number from any mobile telephone as well, even if you do not have roaming. Although the number is declining, you can still find payphones in many public areas, especially stations, airports etc. You can usually pay with cash and sometimes by creditcard or, for international calls, special phonecards are still available. Mobile phones are heavily used. The main networks are T-Mobile, Vodafone, Orange and O2. 3G data services are available, usually priced per megabyte and coverage is usually very good in the UK, however it may lack in rural areas. Roaming on your personal phone plan can be expensive. To manage costs, consider purchasing a local UK SIM card for your phone. Several companies offer local SIM cards including Telestial, and CellularAbroad. The Royal Mail provides postal services in the United Kingdom. The Royal Mail's store fronts are called Post Office and offer services ranging from sending letters and packages to foreign currency exchange. Use the branch locator to find the nearest Post Office branch. There will be at least one post office in any town/city and there are quite often post offices in larger villages. It's common for a post office to be incorporated into a grocery store, where there will be a small counter located at the back of the store for dealing with post related matters. All post offices are marked with signs that say 'post office' in red lettering. Post boxes can be found at any post office and standalone large red post boxes on the streets or red boxes in the sides of public buildings. For sending packages overseas, it might be a good idea to check prices and services with international companies like TNT, UPS or DHL. We have a comprehensive list of accommodation in Liverpool searchable right here on Travellerspoint. You can use our map to quickly compare budget, mid-range or top of the range accommodation in Liverpool and areas nearby. This is version 63. Last edited at 3:10 on Aug 2, 17 by sleepBot. 68 articles link to this page.